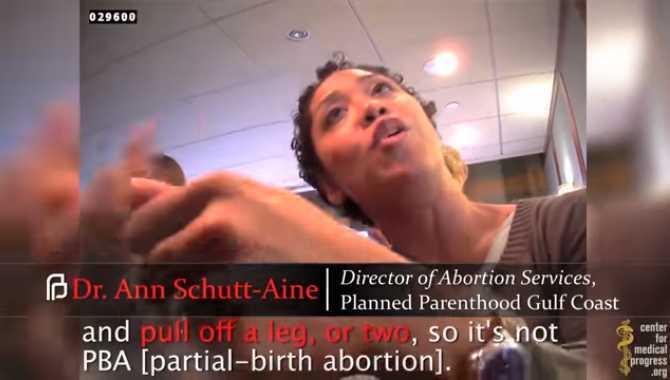 A new undercover video released by the Center for Medical Progress (CMP) features clips of various Planned Parenthood officials and other abortion advocates making nonchalant statements about the abortion process, including that the baby’s eyeballs fell into their lap or that they had to tear off a leg to avoid technically performing a partial-birth abortion. The footage, which was removed by YouTube on Thursday, reportedly was recorded at the 2014 and 2015 National Abortion Federation conventions. The video was marked as a “preview” of longer forthcoming presentation. “If I’m doing a procedure, and I’m seeing that I’m in fear that it’s about to come to the umbilicus (navel), I might ask for a second set of forceps to hold the body at the cervix and pull off a leg or two, so it’s not PBA (partial-birth abortion),” stated Ann Schutt-Aine, the director of abortion services for Planned Parenthood Gulf Coast. “An eyeball just fell down into my lap, and that is gross!” also declared Uta Landy, the founder of Planned Parenthood’s Consortium of Abortion Providers (CAPS), generating laughter. The video also features officials explaining that certain body parts are in demand from biomedical companies. “You know, sometimes she’ll tell me she wants brain, and we’ll, you know, leave the calvarium (head) in till last, and then try to basically take it,” outlined Deborah Nucatola, the senior director of medical services for the Planned Parenthood Federation of America. According to reports, U.S. District Judge William Orrick is now considering charging CMP director David Daleiden with contempt for releasing the video. Orrick had issued a preliminary injunction in February 2016 banning Daleiden from releasing any videos recorded at the National Abortion Federation convention. The Federation had sued in July 2015 to stop the footage from being made public, claiming that it could jeopardize the safety of its members. While YouTube removed CMP’s video on Thursday, a pro-life news outlet copied the video and uploaded it to its own channel.